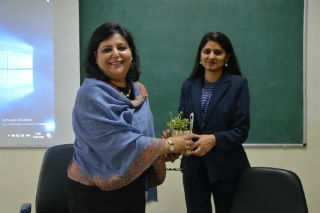 JIMS organized a guest session with Ms. Geetanjali Pandit on Saturday 17 February, 2018 and it was a wonderful experience with her. She is the author of the book “BUDDHA AT WORK” and has been in Corporate HR roles with companies like Zee Media. She delivered an enthralling talk on Buddha in the contemporary world who has to face and pass through many obstacles and challenges in life. She also talked about a Buddha which is in all of us, and we have to keep ourselves determined towards achieving enlightenment i.e. success. She pointed out how James Bond, being a charismatic personality has ability to keep himself calm even in the worst of situations. I really liked the idea of James Bond and it became very inspiring and motivating as I also aspire to be like him in real time. In the end of the session Ms. Geetanjali conducted a meditational and an alleviating exercise which I loved the most. I envisioned myself in the process as being successful, happy and prosperous. 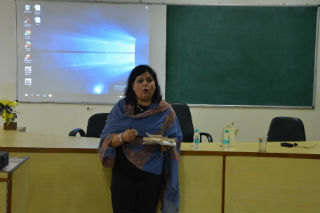 I hope Ms. Geetanjali Pandit comes again in the premises to deliver a talk on more concepts and enlightens us with her experiences and knowledge.